She is still dearly missed. Diana, Princess of Wales, thanks a young girl for the gift she gave her outside the Commonwealth Day Council Gala lunch in Sydney November 1. Diana is in Australia on a three-day fund raising trip. 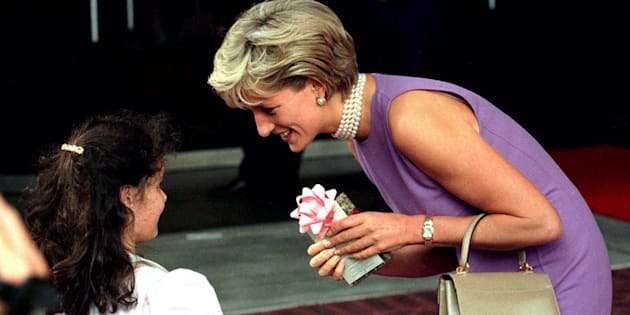 It's been nearly 20 years to the day when Diana, Princess of Wales, died in a car accident in Paris, and to mark the occasion, people are sharing sweet stories of the mom who touched so many lives. As we know, Diana was an active humanitarian who used her profile to shed light on countless issues such as HIV/AIDS, landmines, leprosy, and the homeless. Diana, Princess of Wales, being presented with a bouquet of flowers by a young patient, during her visit to Northwick Park Hospital, in north-west London. She was there to unveil a foundation stone for a new children's casualty centre. The style-savvy royal also deliberately used her wardrobe to convey "approachability and warmth" when meeting members of the public, whether it was on a charity mission, or when meeting dignitaries. Eleri Lynn, who curated Kensington Palace's exhibition Diana: Her Fashion Story, explained to People magazine in February the meaning behind the clothing choices of the "People's Princess," including why she didn't wear gloves. "[Diana] abandoned the royal protocol of wearing gloves because she liked to hold hands when visiting people or shake hands and have direct contact." Eleri said. "She also stopped wearing hats because she said, 'You can't cuddle a child in a hat.'" "You can't cuddle a child in a hat." She also deliberately wore brightly-coloured clothes when visiting children. "When she was visiting hospitals for example she would wear cheerful clothes that would convey warmth and often chunky jewelry so that children could come and play with them," said Lynn. Diana's style also changed dramatically from when she was a newlywed (boxy cuts, tweed, pale colours) in the early '80s to the independent, stylish woman we're more familiar with. "The '90s you really see her fashion is pared back and simplified," Lynn said. "Following her separation from the Prince of Wales, those close to her recall she wanted to be known as a work horse, rather than a clothes horse, and she knew that to focus attention on her work she needed to simplify her daytime look." It's heartwarming to know then that her sons, Princes William and Harry, are helping her legacy live on with charity work that was close to their mom's heart. Harry co-founded the charity Sentebale, which cares for child victims of poverty and HIV/AIDS in Botswana and Lesotho. The Princess of Wales arriving at an AIDS Information kiosk in the Latin quarter of Paris. "The charity is a way in which Prince Seeiso and I can remember our mothers, who both worked with vulnerable children and people affected by AIDS," Harry wrote. "I really feel that by doing this, I can follow in my mother's footsteps and keep her legacy alive." Harry famously took an HIV test at Guys' and St Thomas' hospital in London last year, which was filmed live on Facebook — an event that reflected Diana's earlier work in breaking down taboos with regards to HIV and AIDS. William, meanwhile, is a royal patron of the Tusk Trust, which helps protect wildlife and conservation efforts across Africa. Diana was a patron of the Chipangali Wildlife Orphanage in Zimbabwe, which rescues and cares for orphaned, injured, and abandoned wild animals, from 1983 until her death. Clearly, Diana's memory still lives on.